We're pleased to announce our first keynote speaker for the Embedded Vision Summit, taking place May 20-23, 2019 in Santa Clara, California. 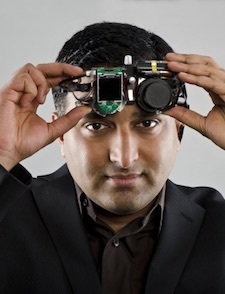 Ramesh Raskar is an award-winning innovator with over 80 patents and the founder of the Camera Culture research group at the MIT Media Lab. In his talk "Making the Invisible Visible: Within Our Bodies, the World Around Us, and Beyond," Raskar will show us the work he and his team are doing in combining novel camera technologies and deep learning AI algorithms to deliver advanced imaging and visual perception, in the process highlighting how vision technology continues to make possible new and seemingly impossible applications. The Embedded Vision Summit attracts a global audience of over one thousand product creators, entrepreneurs and business decision-makers who are developing and using visual AI technology. The Summit has experienced exciting growth over the last few years, with 97% of 2018 Summit attendees reporting that they'd recommend the event to a colleague. The Summit is the place to learn about the latest applications, techniques, technologies, and opportunities in visual AI and deep learning, and online registration is now available.